Frito-Lay North America announced on Wednesday that it will field a fleet of 176 battery-powered delivery trucks made by Smith Electric Vehicles. In the first wave, five each will be operated in New York City, Columbus, Ohio, and Fort Worth. Six will be in Canada. New York, where the rollout was financed through a grant from the New York State Energy Research and Development Authority, was the first to deploy its plug-in delivery vehicles. Frito-Lay, a division of PepsiCo, has 18,000 trucks on the road. According to Mike O’Connell, the national director of fleet capability for the company, most of the Smith electrics will be 24-foot Newton box trucks with 80-kilowatt-hour lithium-ion iron phosphate battery packs with a 100-mile range. But in New York there will be some 22-foot trucks, he said. The full order of battery trucks, which take six to eight hours to recharge, will be delivered later this year and into 2011. Frito-Lay also operates 3,000 clean diesel Mercedes-Benz Sprinter vans. The company has also partnered with Bright Automotive, which plans to market a plug-in hybrid van. Mr. O’Connell said the Bright Idea van, with an extended range, could be used on Frito-Lay’s longer routes. The Smith trucks, which can carry 16,000 pounds and reach 50 miles per hour, will ultimately be cheaper for fleet operators than the standard diesel alternative, Mr. Hansel said. Although the $85,000 to $90,000 purchase price of the Smith trucks is significantly higher than the $60,000 for the equivalent diesel, he estimated that the electric vehicle would operate for less than 10 cents per mile, compared with 40 cents per mile for the diesel. “We are also much cheaper in maintenance costs,” Mr. Hansel said: “10 cents per mile compared to 20 to 30 cents.” He estimated the savings over the lifetime of the vehicle would be $50,000. Smith has been the recipient of $32 million in federal money, and President Obama visited its production center in Kansas City, Mo., in July. Buyers will not get subsidies to buy the trucks, but will receive fees for taking part in a federal demonstration project (two years for some companies, three for others). Smith’s launch partners include Coca-Cola, Staples, AT&T and the utility PG&E. 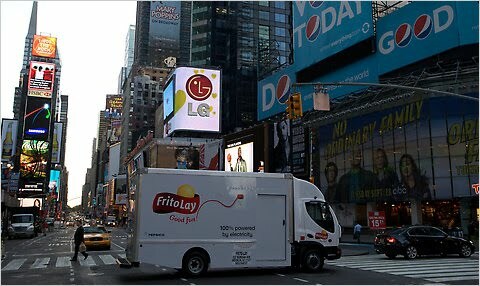 With all 176 electric trucks on the road, Mr. O’Connell estimated that Frito-Lay would reduce its fuel use by 500,000 gallons annually. He also said each truck emits 75 percent less greenhouse gas than a conventional diesel vehicle.